THE 2018 premiers do not have too many pressing needs for their list, especially considering their premiership window is wide open. Coming off the premiership, the Eagles do not have any significant holes in their list management – they have a well-stocked midfield, an array of gun forwards, some excellent defenders and serviceable ruckmen. They enter the draft at pick 20 and depending if he slides, the Eagles could look to Perth product Ian Hill to fill the shoes left by the retired Mark LeCras. Hill is a similar damaging small forward to Fremantle star Michael Walters, and would add an extra spark to an already impressive forward line. They might opt for a taller forward option in Sam Sturt or Curtis Taylor if either are on the board. West Coast could be the side that pounces first on Bailey Williams if they think he can fit amongst their talls and secure a long-term ruck/forward rather than a short-term mature-ager. With pick 22, West Coast could look at Victorian pair Xavier O’Halloran and Ely Smith. 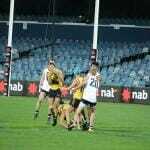 O’Halloran, a product of the Western Jets, is seen as the best leader in this year’s draft pool and is a midfielder capable of inflicting damage on the scoreboard – traits similar to Richmond’s premiership captain Trent Cotchin. Smith on the other hand is a speedy and competitive midfielder who attacks each contest with vigour, similar to St Kilda’s David Armitage. It is expected the Eagles will receive a bid for Next-Generation Academy member Jarrod Cameron around pick 40 and will certainly match the offer, giving up their remaining picks for the Swan Districts product. Cameron is a small forward who is raw but has plenty of upside. If they look to add a tall late in the draft, perhaps they turn to James Blanck, Riley Grundy or Kyle Reid who could be there in the final stages of the draft. There is talk that the Eagles will look to add ex-Sydney player Harry Marsh or ex-Brisbane player Marco Paparone in the Rookie Draft. Marsh will add to the small-medium defensive options, especially considering Shannon Hurn is 32. Paparone will be the fourth recognised key defender at West Coast behind Jeremy McGovern, Tom Barrass, and Will Schofield. PORT Adelaide’s 2018 season can only be described as a “wasted season.” The Power were sitting in fourth position after round 16 with 11 wins, before slumping to tenth spot, winning just one more game before the season concluded. They recruited strongly in the 2017 off-season, bringing in three players – Jack Watts, Tom Rockliff and Steven Motlop – but their goals of moving up the ladder with the extra experience did not pan out. The 2018 AFL Draft is crucial for Port Adelaide as they have three first round picks which they have to nail. At pick five they will likely consider a Sandringham Dragons player with Max or Ben King, or Bailey Smith all coming into consideration. Jye Caldwell could come into the Power’s thinking, though the inside-leaning midfielder would be used more on the outside. Expect a best available selection with pick five, likely to be a King. The Power are stocked for key position players, but the ones in the forward half are ageing, with Justin Westhoff and Paddy Ryder in the twilight on their careers. Port has more depth in the key defensive posts, but might decide to bring in Ben King to be the future star – who could also play forward. With pick 10, they could look to West Australian Jordan Clark who will add skill on the half-back line or wing. Like Hamish Hartlett, Clark can turn a defensive situation into an offensive opportunity with his physicality, smarts and supreme skills. Other players that are in consideration with this pick are Jackson Hately, and Chayce Jones, while another to keep in mind is Western Jets’ Zak Butters who will reportedly go inside the top 12 selections. With the third pick, if one of the above slides, the Power should look to snap up another running player, while Xavier Duursma seems a perfect fit for Port Adelaide at the selection. West Australian, Ian Hill fills the void for outside speed and skill, while Port are perfectly placed to throw some bids on the likes of Tarryn Thomas and Isaac Quaynor both of whom could fill needs at the club. At pick 85, the Power may look at a key defender with Tom Jonas, Tom Clurey, Dougal Howard and Jarrod Lienert the only recognised key defenders. Some prospects include Connor Idun, Kyle Reid, and Riley Grundy. They could consider a small forward if they had not already picked one up, with Hayden Sampson, Kade Chandler and Boyd Woodcock among the South Australian talents who could be there, while Jed Hill, Jai Nanscawen and Zane Keighran are Victorians who could be sneaky chances. Some left-field choices include Western Magpies’ Adam Tipungwuti or Frankston’s Corey Rich, though both could be rookie selections. MANY commentators and punters predicted North Melbourne to be in the bottom five of the AFL in 2018. However, the Roos defied these predictions, finishing ninth with 12 wins (one win away from the top eight). During the Trade Period, the Roos brought in a heap of talented players such as Aaron Hall, Jared Polec, Jasper Pittard, and Dom Tyson. They also secured plenty of draft selections to secure academy and father-son prospects. It is likely North Melbourne will receive a bid for their highly-rated Academy prospect Tarryn Thomas between pick seven and pick 20. The Roos should happily match the bid for the talented youngster thanks to the multiple picks in the 40s. Thomas is a highly skilled and explosive line-breaking midfielder who can impact the scoreboard, much like Gold Coast star Jack Martin. Thomas has the capabilities of playing from round one next year. He has high offensive drive and moves well, while having the prototype size of 189cm that he can fill out and be a valuable contributor at Arden Street. The Kangaroos will also match a bid for father-son prospect Bailey Scott in the second round. The son of former Geelong and North Melbourne champion Robert, Scott is a versatile midfielder with clean hands, neat skills, a good ball-winning ability and someone who oozes leadership. He does not have too many deficiencies in his game and Kangaroos fans will be excited by having him on board because he offers consistency and an ability to roam around the ground. Finally, the Kangaroos have nominated fellow father-son prospect, Joel Crocker, son of Darren. He has not had much luck getting on the park in the past 18 months, missing his entire top-age year this season, but has nice athletic ability and some great upside for the future. He is a long-term prospect who might take some time, but should be worth the wait when he fully develops. The . Kangaroos could well head home with just Thomas, Scott and Crocker, making it an easy night for both the club and supporters knowing who will walk into Arden Street the next week. With the club having four list spots to fill, they will likely pick up a late prospect, who could be someone like an Angus Hanrahan or Tyron Smallwood who could be selected before Crocker, or perhaps they opt for a tackling small forward in Hayden Sampson. In the rookie draft, North Melbourne will look to bring in a mature ruckman to help support All-Australian Todd Goldstein. Some players the Kangaroos should be targeting include former Western Bulldog Tom Campbell, Claremont product Oliver Eastland, Central Districts’ Darcy Fort or Southport’s Fraser Thurlow. AFTER finishing fourteenth with just eight wins in 2018, Fremantle went on a recruiting spree, acquiring gun key forwards Jesse Hogan and Rory Lobb, a solid midfielder in Reece Conca and the speedy Travis Colyer. However they did lose star on-baller Lachie Neale to Brisbane, which leaves a significant hole in their midfield. 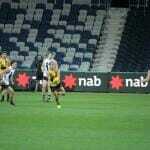 But the Dockers have an array of picks and will look to the draft to further bolster their needs. Fremantle originally went into the trade period armed with only picks five and 77 but some smart trading saw them acquire more picks to consolidate their rebuild. Their final draft positioning may change, nonetheless we will analyse who the Dockers should look at with each of their picks. The Dockers do not enter the draft till pick 14, but could potentially snare local gun Ian Hill to fill their needs for a smart and crafty small forward. With Hayden Ballantyne nearing the end of his career, and with Brandon Matera coming off a poor 2018 campaign, Hill could be the spark up forward the Dockers crave. Other possible options include Zak Butters, Xavier Duursma, and Ned McHenry. If he is available at pick 31, the Dockers could have a steal in Perth’s Sydney Stack who is one of the most exciting and impactful midfielder/forwards in this year’s draft pool. Despite only standing at 177cm, Stack has shown a desire to crash-and-bash his way through packs to win the hard ball before finding a teammate in open space. As well as showing an outstanding ability in the midfield, Stack can drift forward and have a presence inside 50. Other players around the mark may include James Rowbottom and Jack Ross. Fremantle has been linked to South Australian young gun Tom Lewis and should snare him with pick 43. Lewis has been likened to former Docker Lachie Neale, because of his size, accumulation, contested work and his leadership qualities. It is also worth noting that Lewis is close with Dockers’ young gun Mitch Crowden and this may sway Fremantle in picking him at this selection, while another South Australian, Boyd Woodcock might come into the Dockers’ thinking. With picks 65 and 81, the Dockers should look at some mature-age talent from the WAFL, SANFL or VFL. By choosing a mature-age midfield option, the Dockers will have a ready-made prospect who can slide into the midfield alongside Fyfe, Mundy and Blakely. Players to look at include Jye Bolton, Mitch Grigg and Michael Gibbons. It is worth noting though that the Dockers will likely have a late bid on Academy pair Jason Carter and Tom Medhat, but there is a strong possibility that both could go to the club through the Rookie Draft. SUBIACO overcame a gallant Swan Districts by just two points at Optus Stadium to take out the 2018 WAFL Colts premiership. Despite being favourites, the Lions were troubled by the Swans throughout the match with the last quarter a see-sawing contest. The Subiaco skipper was inspirational in defence often setting up his team-mates and helping to intercept a host of the Swans’ attacking forays. He collected nine possessions and took two marks, but he always put his body on the line to try and inspire his teammates. The 2017 WA Under 17s State Academy player took home the Mel Whinnen Medal as best afield after an outstanding display. He accumulated a game-high 28 possessions, took six marks and recorded two inside 50s to be a catalyst for the Lions’ victory. His ball-use especially by foot was exceptional, particularly late in the game when players were fatigued. The Maddington product was a serious rival to Hobley for the Mel Whinnen Medal after a sensational performance. He gathered 22 possessions, laid a game-high eight tackles, took four marks, recorded two inside 50s and kicked a goal. He also produced the game-saving smother in the middle of the ground to stop a certain goal for the Swans. 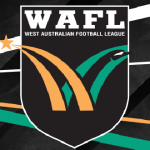 The 2018 WAFL Colts Leading Goalkicker was dynamic up forward for the Lions with 15 possessions, six marks and two goals. His leading patterns combined with his explosive pace and agility made him a nightmare match-up for whoever was playing on him. The 2018 Jack Clarke Medallist was his combative self in the midfield for the Lions. He won 18 possessions, laid six tackles, took four marks, recorded two inside 50s and kicked a goal. His clearances and contested possessions were crucial in getting the Lions over the line. The 2015 WA U15s State Schoolboys’ representative was powerful in the middle of the ground for Subiaco. He finished with 15 possessions, six inside 50s, five tackles and two marks in an excellent performance. The younger son of former Geelong and Carlton player Adrian Hickmott, Wil was sensational on the wing for the Lions. He accumulated 18 possessions, took two marks and laid two tackles in a game that showcased his class. His composure, ball-use and decision-making were all elite, especially when most players were fatigued. The son of Port Adelaide premiership star Jarrad Schofield, Taj was excellent on the wing for the Lions. He collected 19 possessions, took five marks and laid four tackles in a phenomenal performance. Still only 16 years old, Schofield’s decision-making and ball use are extremely sound for someone his age. The reigning Newton Screaigh Medallist was brilliant off the half-back line, with his penetrating skills and his run-and-carry both on display. He finished with 15 possessions, six tackles and three marks, well and truly putting his stamp on the game. Stationed at full-back, Leunig was one of the key catalysts for Subiaco’s triumph. He finished with 12 possessions, five tackles and three marks but his statistics do not tell the full story. He was setting up the defence, often intercepting the Swans’ attacking forays and saved many potential goal opportunities from the Swans. The Sorrento-Duncraig junior showed that he is a big-game performer which will enhance his draft stocks. He collected 22 possessions, took seven marks (including a screamer over a pack of players), laid six tackles, recorded six inside 50s and kicked a goal in a near-best afield performance. 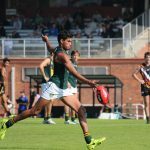 The Noranda junior was a star in the forward line for Subiaco with three goals from 10 touches and four marks. His mobility and his strong aerial presence had the Swans’ defenders nervous. The Bassendean junior was electrifying throughout the match often using his pace to break Subiaco’s defensive zone. He collected 12 possessions, laid four tackles, took three marks and kicked a goal. The Ellenbrook junior was dynamic in the forward half for the Swans, often troubling the Subiaco defenders with his speed, mobility and precise skills. He finished with 18 possessions, four marks, four tackles, four inside 50s and two goals. Arguably the Swans’ best player, Bain did everything he could to get the Swans over the line. He gathered a team-high 24 possessions, laid a game-high eight tackles, took two marks and kicked a long-range goal in the last quarter to bring the Swans within just two points. Without doubt the WAFL Colts Player of the Finals. The Bunbury product produced a performance that would have seen his draft stocks soar. He was powerful on the lead and in one-on-one contests, he was mobile around the ground and was incredibly skilled. He finished with 14 possessions, six marks, five inside 50s, three tackles and two goals. 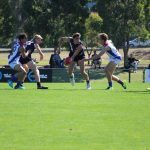 The 2017 WA Under 16s State Academy player fought hard in the midfield for the Black Ducks. He finished with 20 possessions, four marks, three inside 50s, two tackles and a goal. His speed, agility and damaging skills were magnificent. Stationed on the half-back line, Beck proved to be one of the most valuable players for the Swans. His intercept play combined with his decision-making, vision and excellent skills made him extremely damaging. He finished with 18 possessions and seven marks. The Centrals FC product was outstanding on the half-back line for the Swans, often using his dash and skills to break down Subiaco’s defensive zone. He finished with 11 possessions, five tackles, three inside 50s and three marks. The Caversham junior proved why he is one of the highly sought key defenders in next year’s AFL Draft. He only finished with nine possessions, four tackles, three marks and two inside 50s, but his impact was much more significant. He was the chief organiser in defence for the Swans and his ability to halt the Lions’ offensive forays helped keep Swans within fighting distance. The West Coast Academy member showcased why he is one of the best prospects in this year’s Draft pool. He collected 11 possessions, laid four tackles, took two marks, recorded two inside 50s and kicked two goals to be one of the very best players on the ground. His speed and evasiveness had the Lions’ defenders on edge all game. Arguably the best ruckman on the ground, Germs was a key factor in almost helping the Swans get so close to victory. He accumulated 12 possessions, won a game-high 31 hit-outs, recorded four inside 50s and laid three tackles in an inspiring performance.